For further information please phone 074 93 81054, email info@greencastlecentre.ie or visit us on Facebook. - Core Care free counselling service available. Please call 0044 7849223114 or 074 93 81054 to book an appointment. - Kid’s Art Classes coming soon! - 'Dumbo' inspired Easter camps on Monday 15th April. A circus extravaganza. Cost €20. Call/Text 083 4627073 to book. - Kids Guitar lessons every Wednesday from 5:45 – 6:30pm. Tel: 086 0634903. - Women’s Self Defence Classes on Tuesday at 5:30pm. - Mick O’Toonz animation workshop is on the 23rd April from 10am – 1pm. Cost €20. Tel: 086 2127923. - The Irish Heart Foundation Mobile Unit will be at the centre on Thursday, 11th April, from 10am – 3pm. Free heart checks and info. - We are taking names for an ipad / smartphone / tablet course starting after Easter. Contact the centre to register. - Free study space available for students. - Yoga with Mary on Monday at 11am & 7pm. Booking is essential. Tel: 086 8276720 / 074 93 82515. - Kid’s Chess Club every Friday from 4:30pm – 5:30pm. Cost €5. - North Star language therapy group for 18 months – 3 years. Tel: Catriona on 086 3616878. - Messy Monsters Messy Play on Monday and Wednesday. Ages 3-5 from 2.30pm - 3.30pm and ages 5-7 from 4pm - 5pm. Six week block costs €40. Booking is essential. Contact Sarah on 086 8766637. - Messy Monsters Easter Camps on 17th April & 24th April from 1pm - 4pm. Tel: 086 8766637. - Wee Arts music & movement at 10am on Monday. Suitable for children aged between 0-5 and their caregiver. Tel Debbie on 0044 7899040217. - Musical Memories Singing Group is a group for older people, especially welcoming to people affected by dementia and memory loss, their families, friends and carers. Monday at 11:15am. Cost €5. - Kid’s Singing Lessons on Friday from 6:15pm – 6:45pm. - Zumba on Thursday at 8pm. Tel Gwyneth on 083 4627073 to book. - Tai Chi on Friday mornings at 10am. - Senshi Martial Arts Kickboxing every Tuesday for Kids from 6-7pm and adults on Thursday from 7-8pm. Tel: 083 8554997. - Shooting Starz Gymnastics on every Monday from 4-5pm for 5yrs, 5-6pm for 10-13yrs, 6-7pm for 6&7yrs and 7-8pm for 8&9yrs. €5 per class and €40 registration fee. We are hoping to run a preschool class soon. - Greencastle Tennis Academy with Liam Sweeney, professionally qualified tennis coach, on every Tuesday & Thursday at 4:30pm for 5yrs+. New faces welcome. Call Liam for more information on 048 71 226223 or email sweeney07@virginmedia.com. - Greencastle Women’s Group meets on the 1st Wednesday of the month at 10:30am. New faces always welcome! - The Coyle School of Irish Dancing: For fun, for Feiseanna and for grading/examinations every Friday at 3:15pm. Call Janet on 086 8059955. - Rachel’s Relax Kids at Greencastle Community Centre. Tel Rachel on 087 6126210. - Baby & Toddler Group on Thursdays from 10am -12pm. €3 per child and €5 per family. Snacks & drinks included. New faces welcome! - Pilates for adults and dance classes for children (ballet age 4+, hip hop/jazz age 8+) with ZoNa Dance Company at Greencastle Community Centre. Contact: 086 8222189 for more info or www.zonadanceco.com. - Brazilian Jiu Jitsu for kids and adults on Tuesday & Friday at 7:30pm. Tel :0044 7597313759 for more info. First class free! - The Write Stuff Kids Club, Creative Writing & Storytelling on Tuesday from 5pm - 6:15pm. Contact Grainne on 086 3148541. - Slimming World every Wednesday at 7pm. 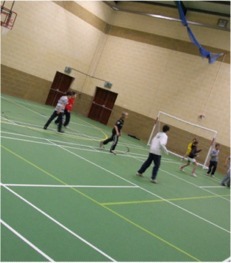 Easter Camp on Tuesday, 16th April, from 2:30pm – 4:30pm. - Large, modern office space available to-let. All mod-cons, high-speed wifi, landline access, self-contained kitchen facilities and storage. Contact the centre for more information. - Birthday parties, bouncy castle, multi-sports and party room all under one roof. Call us for more info! - 24/7 accessible defibrillator is located at the centre in an outdoor case in a prominent location at the front of the community centre and is accessed by entering a code on the digital keypad which is obtained by dialling 999 or 112. Defibrillator is easy to use and fully automated. - Competitive rates on room rental available for classes, workshops, training; Introductory offers. Call the centre for more info! - Fantastic selection of kids and adults books available at the centre for a small donation. - Aine Havlin Fitness at Greencastle Community Centre. Tel: 086 0681696 for more info and to book a class/pt session/bootcamp. - What courses/classes would you be interested in attending at Greencastle Community Centre? – Let us know! For further information on any of the above please phone 9381054 or email: info@greencastlecentre.ie .